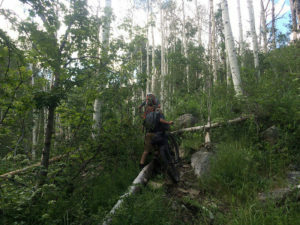 Home » bike packing » GROWING PAINS. I can recall a time I felt growing pains. I was walking down the hallway in our house and a sudden pain shot through my leg, in fact I remember crying out that I had just been shot in the leg with an arrow, a flint tipped Port Orford Cedar shaft right through my femur. I’ve recovered from the incident, and have since grown to the towering height of 5’9 (take that Port Orford Cedar). The point is we all experience growing pains; in our bodies, relationships, jobs, in everything. Life. This last summer I was scouting out a bikepacking route for a group of high adventure scouts. The leaders wanted the boys to be pushed to their limits but still survive, thus avoiding the wrath of the ever-looming matriarchs. It just so happened that summer I found the most opportune subject in my fourteen-year-old nephew. I knew his matriarch, and wasn’t afraid of using him as the guinea pig. I planned out the route knowing what to expect 80% of the time; the 20% of unknown was a bonus and the real test (I thought) for my nephew and his age group. 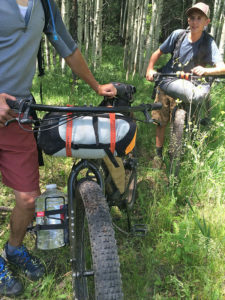 For those of you not acquainted with bikepacking, simply put it’s taking everything off your back you would use for an overnight backpacking trip and attaching it to a bike. Then ripping down trails, fire roads, and two tracks (oh and the grueling uphill that always comes with the down). It’s a grand time. Weekend arrived, we kitted out, and set out. 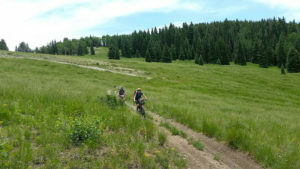 The first section of the ride is a well-used quad trail, flowing gradually down hill like a river, and like any proper river has a few rapids. Having navigated it many times I bobbed and weaved through rock gardens and two foot drops. I had the upmost faith in Nat’s skills and knew that she would survive. In hindsight I should have covered my nephew in Go-pro’s, as he took on every rapid and failed miserable but recovered admirably…we missed out on some great crash footage. The next bit was the unknown to me. It is an old two-track road that has been overgrown for the last umpteen years. The riding has potential, but the encroaching gamble oak reminded me of a scary movie scene that has arms reaching out to rip and tear their victims apart–the gamble oak was not much better. We all received a few slaps to the face, shirts ripped, and it was a gamble (pun intended) to use speed to bust through as an occasional oak arm would grab a fist full of break lever resulting in a bushy endo. In the end it was easier to push through all the grabby, grabby. Gaining a little in elevation we worked our way out of the slap happy forest and entered lush green meadows with knee high grass (a rarity in these parts) it was beautiful–in the kind of way an American GI would view the Guadalcanal or the jungles of Vietnam. Beautiful if you didn’t have to move to get through it. Hiding in the grass were hundreds of downed aspen trees not worth going around. We would dismount and carry the fully loaded bikes over and over. 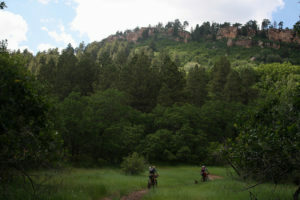 The short distance riding was not worth it, so we became mules and pushed, pulled, and hiked the bikes. It became particular enjoyable as the terrain got steeper and steeper. 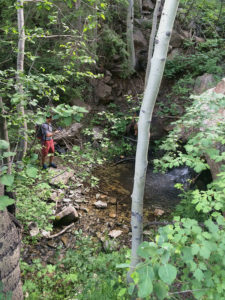 We did come across some interesting geological features for these parts, such as granite boulders like you would find in Little Cotton Wood canyon. The thought crossed my mind to re-visit the place with some bouldering pads, but the thugs in the slap happy forest pushed that thought aside. I would have to get my “Ash”(see Evil Dead for that reference) on in a serious way to accomplish that mission. Eventually, we reconnected with a well-used track and enjoyed some deserved down hill time. We then spent the rest of the day and well into the evening burning our legs and lungs out on a consistent six mile climb. That night sitting around the stove on a ridge; huddled in our down jackets, backs to the wind and eyes on the stars I asked my nephew what he thought so far. His response, though pleasing, was surprising; he liked it, said it was harder than he thought it would be. Come to find out this was his first time camping away from a car. 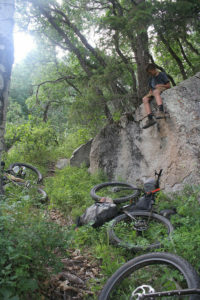 He had never spent a night out on a backpacking trip let alone a bike-packing trip. I thought about the activities of the day, especially his additional pain and suffering with all the extra wrecks he endured. Lots of pain, but lots of growth. Besides a brutal little push up some steep two track the day, and trip, ended with five miles of rushing trail. Once again I lamented the forgotten go-pro to document a young boy’s many and mighty wrecks. As expected the rapids didn’t disappoint and my nephew wiser from previous encounters took his time to pick a line and ride them out. He’s only fourteen and has lots of growing to do and with that, lots of pain. We all have growing to do in one-way or another, but that’s how you know your progressing, learning and enjoying life. Get out and feel some growing pains.